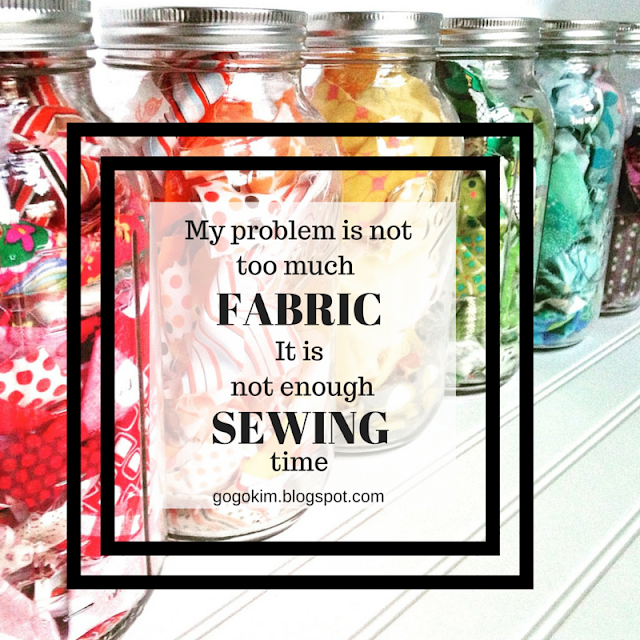 I Do Not Have a Fabric Problem! Inevitably, people see my sewing room, It is open to both the kitchen and the main entry to my home. It takes up the entire space that was originally designed to be the formal dining room. It was taken over by me and the kids as a shared space and then was completely taken over by all of my sewing paraphernalia. I have shelves of fabric of all colors displayed on white Ikea shelving. 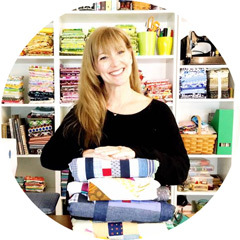 When people visit and see all the fabric their first response it usually "WOW!" and that is usually quickly followed up with, " Do you really use ALL of this fabric?" This statement could possibly also be muttered from time to time by the people that live in the ever expanding fabricpalooza that may, at some point, test the foundation of the beams in the basement. It's like you have the big box of 128 crayons. You may not be using them all today, but yes, you do need to have them! Oh you said it, Quilty Sister!! I totally agree. It is not a fabric problem. When my grandson saw my fabric room, he asked it I had a clutter problem, if he knew about hoarding he might have asked that question. No, and you are lucky I love you. The other question that gets me is when someone asks, What do you do with all those quilts you make? err....use them. Yes, exactly! We turned our formal living room into my sewing room, so it is also one of the first things people see when they walk through the front door. Also, my stash extends into two other rooms. My husband loves to take visitors on a "tour" of my stash, and they usually have the same reaction. But when I'm doing a scrappy quilt, sometimes I need just an inch or two of something very specific, and I'm so glad I have an extensive stash. We did the same thing; turned our formal dining room, which we never used, into my sewing studio. Yes, it's open to the living room and yes, I'm gradually taking over more of that space.! My husband is so supportive and I love my space. It makes me so happy to sew in there!